(4) Ronald & Reginald Bassett from "The High Tones"
The last article this month was written by David Attride (and edited for the newsletter) and deals with the many different Bassett families of Wales and his effort to identify his line of the family. Much more will be seen on this at our website in the future where we hope to include transcriptions of all of the wills that David has found to date. Watch for a newsletter announcement with a link to these wills once they are complete in 2010. Several new DNA results are back and are featured below. Family Tree DNA has once again announced special pricing for DNA tests good through then end of the year. If you have been thinking of participating in the DNA project, now is a good time to join. If you are interested in taking part for this reduced price, let me know and I can give you the details. DNA 37 marker results are back for the following two family lines. #61B Joseph Bassett of Glastonbury, Somerset, England whose descendants settled in New York State. Results for this line were very unexpected. Not only does this test not match any other Bassetts, it does not match closely to anyone else in the Family Tree DNA database. This is the first Bassett test with such results. A test of a descendant through a different son of Joseph might be beneficial to verify Joseph's DNA haplotype. Results do not match any other Bassett groups exactly, but do have a close match to the #39B Bassetts of Norfolk, England. #376B Thomas L. Bassett of W.A. Sterling Louis Bassett, born 1915, died 1996. A memorial service for Sterling L. Bassett, former chairman of Itasca-based Gallagher Bassett Services, will be held at 2:30 p.m. Monday in Hospice House, Fort Myers, Fla.
Mr. Bassett, formerly of Barrington, died last Monday at his home in Sanibel, Fla. He was 81. 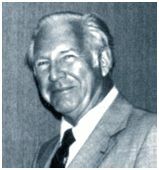 In 1962, Mr. Bassett played a major role in developing Gallagher Bassett Services Inc., a subsidiary of Arthur J. Gallagher & Co., also in Itasca. He retired about 15 years ago but remained with the firm as a consultant until his death. "Mr. Bassett was a pioneer in the field of risk management consulting and claims administration," said Arthur J. Gallagher. Under his leadership, Gallagher Bassett grew from one employee - Mr. Bassett - to 1,262 in 1995; annual revenues grew to more than $112 million, with more than 100 offices in the United States, Bermuda and United Kingdom. Mr. Bassett was an American Contract Bridge League Life Member. A widower, he is survived by a son, David; a daughter Lynn Hope Cenek; three grandchildren, and two great-grandchildren. Section 4 - Featured Bassett: Ronald & Reginald Bassett of "The High Tones"
The following is a picture of the musical group "The High Tones" taken about 1961. The group featured Ronald & Reginald Bassett, twin brothers, seen the middle of the group. Their grandfather was named Clarence Bassett and Clarence was born in Bermuda. 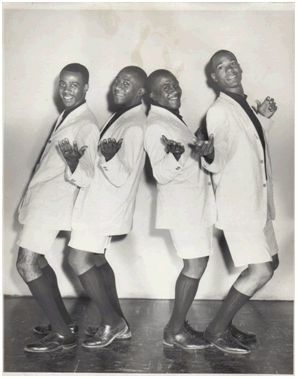 The were brothers of Clarence Henry Bassett, a member of Shep & The Limelites, who was featured in the May 2006 newsletter. The picture was provided by Paul Williams who was searching for the Bassett brothers after not being in contact for 45 years. Ronald Bassett is still singing with two different groups including the Limelites. KEARNEY, Neb., March 15 – Samuel Clay Bassett, 82, Nebraska pioneer and historian, died Sunday at his farm home four miles northeast of Gibbon, after a lingering illness from influenza. Despite his age, Mr. Bassett retained vigorous health until last fall, when he was injured in a fall from a tree while picking apples in his orchard. Although his injuries were superficial, his stamina was broken. Two weeks ago he suffered an attach of influenza, his lungs became infected and since then he sank steadily. His widow and two children survive. Samuel Clay Bassett was a dominant factor in the rapid development and progress of agriculture in Nebraska. For more than half a century, Mr. Bassett served intermittently on various committees with various farm organizations of the state which had for their purpose the institution of better agricultural methods. As a member of the state legislature in 1885 and again in 1911, first president of the Nebraska Dairyman’s association in 1885 of which he served as secretary for twenty-five years, president of the Nebraska State Board of agriculture and as a guiding light on several pioneer state and county farm organizations, he was called by some to be the Nebraska dean of agriculture. Mr. Bassett was born in a log cabin at Walton, New York, on July 14, 1844. He attended a rural school and in 1861 was graduated from Corning academy at Corning, New York. In 1861, he enlisted in Company E, 142nd New York infantry in which he served with distinction until the close of the war. In 1871, with his wife and two children, he came to Nebraska, taking a soldier’s homestead claim of 160 acres in Buffalo county on which his family has continuously resided. This farm is known as Echo farm. Mr. Bassett was a members of the soldier’s free homestead colony, organized in 1871, and which was kept alive although Mr. Bassett was the last charter member of the colony. After serving as a school teacher in Buffalo county for five terms, Mr. Bassett became interested in agricultural development and politics. He was secretary of the first Buffalo county agricultural society, 1875, and through his work became president of the state dairyman’s association, and member of the Nebraska state board of agriculture on which he served for fourteen years. He also was a charter member of the Nebraska farmer’s congress, 1910, and of the Nebraska Pure Grain and Seed Growers’ association, 1912. Politically, Mr. Bassett was an ardent republican. He was secretary of the first Buffalo county republican convention in 1871 and won election to the legislature where he introduced important farm measures. In addition, he served as first president of the Nebraska Hall of Agricultural Advancement, 11916, and as vice president of the Nebraska State Historical society, 1909 to 1915. In state and local G.A.R. circles, he also achieved recognition. Mrs. Bassett, whom he married in 1867, died on February 9, 1907, leaving him with seven grown children. They are: Mrs. Edward Prouty, Kimball; Mrs. George Prouty, Shelton, Neb. ; Mrs. June Wooley, Slater, Wyo. ; Samuel B. of Union, Ore., and Clark, Alfred B. and Miss Laura of Gibbon, who lived with her father. The following is a condensed version of the history of research on the 117B Bassett of St.Mary Hill, Glamorgan Bassett family. The entire article can be viewed by clicking on the link below. Brothers: Robert, (ca1780-1849) and John (ca1778-1851) born in Llanstephan parish, Carmarthenshire. Their mother’s name was Jane but their father’s name is not known for sure but may be Thomas (based on an IGI entry of a 1779 baptism in Llangynog parish, Carmarthenshire). 14 Dec 1796 St Mary Hill parish marriage: Richard Bassett, Batchelor of this parish and Elizabeth Edmunds, of this parish, Widow. Signed by Richard Bassett and mark of Elizabeth. Witnessed by Charles Bassett, the mark of Ann David and signature of William Williams. I bequeth unto: Daniel Bassett; Elias Bassett; Moses Bassett and Mariah Bassett all my leasehold property at Treforest ... to be sold at auction and divided between my above named children being the issue of my former marriage. In the event of my getting married again I request that my wife and the issue of such marriage if any, are to have equal share ... I appoint my brother, Daniel Bassett of St Mary Hill and John Lewis of Treforest joint Executors this 30 day of July 1844. Signed by the mark of Thomas Bassett. 5 Nov. 1846 Daniel Bassett of the parish of Llanilid, Farmer, and John Lewis of Treforest in the parish of Llantwit Fardre, joint Executors of the Will of Thomas Bassett late of Treforest in the parish of Llantwit Fardre, Labourer, who died on 4 Sept 1846, duly swore that the goods chattels and credits of the deceased are under the value of £100. I have found no parish baptismal record for this Thomas Bassett. Initially, I listed him as a son of Charles Bassett (1768-1849). Then I found the 1838 birth registration for Mariah Bassett (fortunately a rare forename). Her birth registration lists her parents as: Thomas & Ann Bassett formerly Llewelian and the father’s signature says “The mark of Thomas Bassett father Treforest Llantwit Fardre.“ Remembering the Mariah Bassett, aged 14 yrs on the 1851 census, I realized that she was living with her grandparents, Richard & Elizabeth Bassett in St Mary Hill. I am indebted to my 4th cousin, Bruce Kappele for researching the descendants of Thomas Bassett and for obtaining a Y-DNA sample from one of his male Bassett descendants. 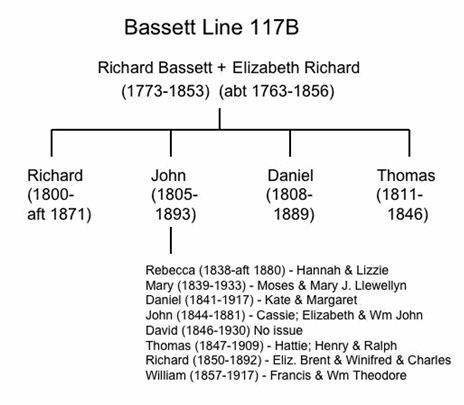 Thomas Bassett had a brother, John (ca 1805 – 1893) who is my great great great grandfather. The photo below is the tombstone of John & Elizabeth Bassett who lived in the St Mary Hill area and are buried at the nearby parish church of Llanilid. The John Griffiths buried with them is the brother of my great grandmother, Mary Griffiths (dau. Of Wm Griffiths & Rebecca Bassett). David welcomes queries about the Bassetts of Glamorgan and can be contacted at the above e-mail address. Section 7 - The following family lines have been added since the last newsletter.